Installed on a tablet PC, the sales force control is the ideal companion for the field service or service staff. With most modern Windows 8 technology VIS-mobile supports each field service coworker by extensive information such as customer data, article lists and order entry. Route planning is also optimized with the help of the system. All data is synchronized via the individual ERP system. Due to its simplicity, the representative information system is the perfect connection between the office and the field service. Sales force control VIS-mobile: For an efficient sales force – on and offline! VIS-mobile is the missing link between office and field service and the ideal tool for sales force control. VIS-mobile enables your field staff to access the data of your ERP system. It does not matter which ERP system you use. VIS-mobile can also supplement your customer relationship management as a mobile CRM system. 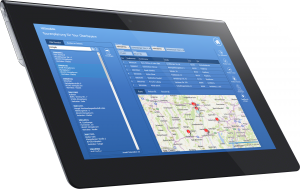 With the representative information system VIS-mobile you have all data on a tablet PC at hand. The access takes place online or offline by means of previous synchronization. With an existing Internet connection, quotations can be sent directly or orders can be transmitted directly to the ERP system. The sales representative can access all relevant article and customer information: ideal for price negotiations!